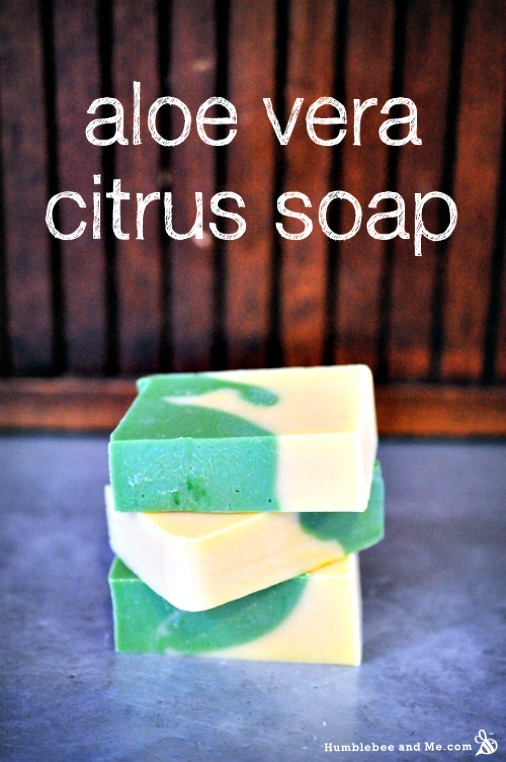 There are so many advantages to making your own soap. You control all of the ingredients including the scents. It’s also generally less expensive to make your own soap. And like any other skill, the more often you make cold process soap, the better you get at it. As an aid, Marie includes a link to her standard, soap-making process.This is a beautiful bi-colored, cold process soap. The yellow color comes from orange buriti oil and the green comes from green oxide. Marie uses lemon essential oil and lime essential oil. She offers some alternative citrus scents. You could also use other essential oil combinations. Marie also has suggestions on how to use either aloe vera powder or liquid in the recipe. I wanted to comment on two of the wonderful ingredients. It’s clear that this soap is both visually stunning and very healing to the skin. Aloe vera – Anybody with an aloe vera plant knows the healing power of the gel on kitchen burns. It’s almost magical. It has antiseptic, antibacterial, antifungal, and antiviral properties. It’s thought that aloe vera increases circulation in the blood vessels in the skin. Along with its antibacterial property, this supports the idea that aloe vera speeds up the healing of skin wounds, burns etc. Buriti Oil – Buriti fruit grows on Buriti palm trees in the Amazon rain forest. The oil is extracted from the fruit. It’s nutrient-rich and contains essential fatty acids, beta-carotene and vitamins. The oil is often used to treat skin burns because it’s soothing and regenerates skin. It supports the development of collagen and also moisturizes. Finally, it’s an anti-inflammatory and is helpful with skin conditions like psoriasis and eczema.